The title of this post made me a little uncomfortable. Here's why. Growing up, I learned to avoid conflict. I was definitely a boat non-rocker. That meant that I mostly kept my opinions to myself, lest I create unwanted disharmony. Over the last few years, I've been unlearning that tendency and giving my two cents worth more often. (What else can you get for two cents these days? I think that's actually a great price for an opinion). Ok, so now that you know the backstory, I can get to my point. My first point. I have a few. I was super excited to see that Marie Kondo had a new Netflix show, because I love her first book, the Life-Changing Magic of Tidying Up, and what's it's done for me and my family. When I watched the first episode, though, I thought it totally missed its mark. Marie is barely in it so that was sad because she is a cute as a tiny dog in a bumblebee costume. More importantly, the show skipped over the key moment. It featured a family who had way too much stuff (obviously). The husband was excited to get rid of it. The wife was not. She loved her stuff, even though some rooms barely had space to walk. The episode highlighted how hard it was for the wife and the tension it created for the couple. The plot was seemingly leading towards a great epiphany for the stuff-loving woman, and then all of a sudden, it skipped to a happy ending. I felt very unsatisfied and also disappointed. The story missed its most important part in the hero's journey; the part where the hero has a realization that the only way to resolve the issue is to go through it. That's why we love stories. We want to witness the hard part and THEN come to the resolution. Seeing other people go through the hard stuff reminds us that we can do it too. It opens the door to living courageously and invites us in. We don't just want the happy ending. We want to feel the struggle too. Those are my thoughts on that topic. If you watched it and loved it, no worries. 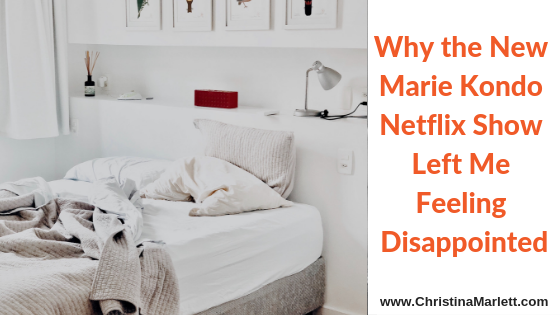 The reason I thought to share my opinion on the Netflix show (now that I've done it, I see that it wasn't that hard, just like usual), is because I just did a podcast episode called The Incredible Lightness of Ditching Stuff. In it, I shared about what it felt like to get rid of 3/4 of our belongings last year when we moved to a smaller space in favour of a better lifestyle. Marie Kondo played a key role in our ability to lighten our load. Before her book, we were happily accumulating more and more things. Except we weren't so happy. The booked helped me realize how much of an energetic burden our belongings were imposing. 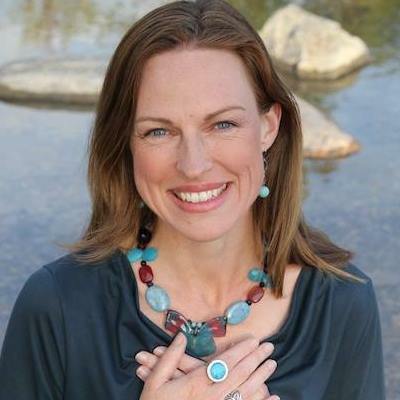 If you want to hear the whole story and learn a fun and powerful process that you can try for yourself, listen to the episode by clicking here. I've been thinking about not rocking the boat. An image keeps popping up for me. One summer, I went to a camp where we did all sorts of nature-y things, including canoeing on a lake. I learned that camp leaders were very different from my parents. 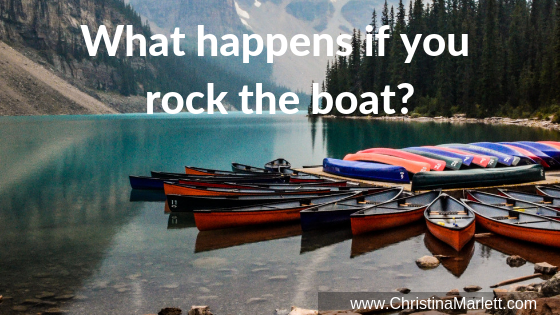 When we canoed as a family, it was all about not rocking the boat, staying in the middle, and remaining calm. Very good advice for small kids in a canoe. With my camp leader, it was not about calm. He instructed us to paddle around for a bit with our partner. Then, to my horror, he told us to climb up onto the point at end of the canoe. My dad would never let us do that! I was terrified. But, I do what teachers say, like a good little goody-two-shoes, and so I carefully climbed up onto that precarious perch as my partner did the same on the other end. There was a lot of boat rocking. Then, as if that wasn't far enough outside of my comfort zone, the camp leader took it one step further. He told us to take turns vigorously bending our knees, thereby bobbing the boat up and down from end to end. The point was to cause our partner to lose balance and fall into the lake. DANGER! DANGER! said my mind loudly. A softer part of my whispered a different thought. I wondered if I could be that reckless. The curious part won out and I started doing deep knee bends like I was preparing to jump into the air. Up and down the canoe bobbed, my partner and I laughing uproariously. Of course we fell in. Now that I think about it, rocking the boat is delightful. It made me laugh out loud, lose my balance and fall into a refreshing lake. It made me feel bigger than I felt before. It made me feel alive. That memory hasn't come to me for decades. Now I can see that I actually love boat rocking. I'm going to remember that.